Customers bought more cookers than cuddly penguins after the department store's latest cute-fest. For most of us Christmas adverts are an opportunity to get out the tissues or go all cynical Scrooge over the corporate manipulation of our tear ducts. For retailers, though, they’re serious business. 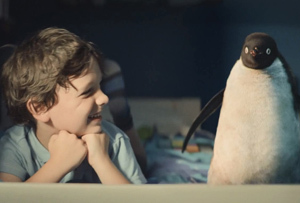 John Lewis’ weekly sales surged past the £100m mark last week for the first time this year, after it released its ad featuring the heartwarming tale of a boy finding a mate for his lonely penguin Monty on November 6th. The £108.8m worth of revenues was 7.2% higher than the same week last year and up 13.7% on the previous one. The department store didn’t highlight the success of its penguin-themed merchandise, although everything from the £35 cuddly toys to cufflinks and onesies has sold out on its website. It seemed rather more excited by the fact that sales of Smeg range cookers were up 179% from last year and that lighting had had a record week. ‘Top of mind for customers this week was giving their homes a pre-Christmas makeover to be ‘guest-ready’ for the festive season, with sales of furniture and home entertaining a driving force,’ the company said in a statement. MT isn’t sure how one ‘entertains a driving force’ (give it mulled wine perhaps? ), but John Lewis’ sales look to be revving up as the festive season and all its schmaltz really kicks in.